Yes, this lovely photo of walnuts, dark chocolate, and red wine against the backdrop of Christmas was my real dinner. This was several weeks ago. Hubby was traveling. I'd worked a long clinic day, and had just picked the kids up from my mother's. My school-age kids ended up with yogurt, fruit, and cereal, while I ended up with this dinner of champions. But it's not a bad dinner, from a nutrition standpoint. Actually, I was rather proud of what I'd put together, for cardiovascular reasons. After all, I've done my research: I've just published a book on this! Healthy Habits for Your Heart is a behavior change focused evidence-based diet and lifestyle book for heart health. I was a bit insane about including the supporting science, so the references section is way larger than the publishers wanted. 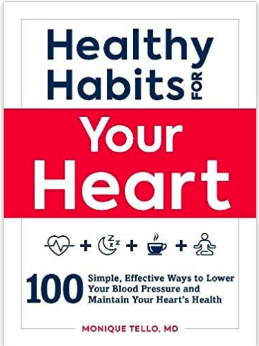 The first section of the book is all about how our behaviors impact our heart health, and how to approach habit change. Then, for each suggested diet and lifestyle habit, I've included tips to make it stick. Want a free preview? Here you go! Pasted directly from the book, to you! I hope folks find it helpful for them and for their patients. Nuts are good for your heart and your life. Research shows that eating four servings of nuts per week was associated with a significantly lower risk of having coronary heart disease (19 percent) or any type of cardiovascular disease (28 percent). ere was also a significantly lower risk of dying from coronary heart disease (22 percent), cardiovascular disease (22 percent), sudden cardiac death (75 percent), or anything at all (19 percent). 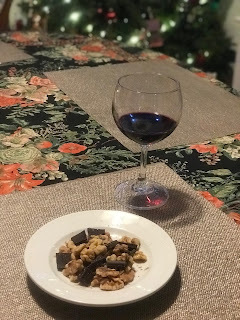 e studies looked at tree nuts (which include almonds, walnuts, pistachios, and hazelnuts) as well as peanuts (which are technically a legume but nutritionally similar to tree nuts). What Does One Serving Size of Nuts Look Like? Regularly stock up on nuts, but keep budget in mind. Nuts are cheaper when bought in larger quantities or ordered online. Shop around for your favorite sources. Nuts can go rancid. Store them in airtight containers. Glass is ideal. some in your bag or desk at work at all times. yogurt, oatmeal, salads, or stir-fries. ing Fruit and Nut Bowl with Greek Yogurt; Nutty Tabbouleh Salad (in Appendix A). Research has consistently shown that people who regularly eat chocolate have lower blood pressure, blood sugars, and less heart disease. Chocolate comes from the toasted seeds of the cacao plant, which is rich in healthy plant chemicals called flavonoids, specifically cocoa flavanols. Cocoa flavanols have beneficial effects on our blood vessels by neutralizing toxins, which helps prevent stiffness and plaque buildup, as well as promoting healing. The darker the chocolate, the more cocoa flavanols it has. Milk chocolate sometimes has barely any (it can range from 10–50 percent) and also tends to have more unhealthy fat added. For this reason, I recommend only dark chocolate (at least 60 percent cacao, though the darker the better) and only a small amount. One serving is two small squares (about 50–60 grams total), and science suggests that two or three servings per week provide the most benefit. Do you like chocolate, but not dark chocolate? It is less sweet but definitely much better for you than milk chocolate. e intense cocoa taste is what can help prevent us from overeating this calorie-dense treat. Start with a small amount and build up over time. The less milk chocolate you eat, the more dark chocolate will begin to taste like normal chocolate to you. Add a teaspoon of pure unsweetened cocoa powder to your co ee in the morning for a mocha treat. Use only dark chocolate chips or chunks (60 percent or higher cacao) in baking and cooking. Try these recipes: Dark Chocolate–Dipped Strawberries; Orange Pistachio Dark Chocolate Bark; Cherry Chocolate Overnight Oats (in Appendix A). Use pure unsweetened cocoa powder in your savory cooking as well. Try the Antioxidant Chili recipe in Appendix A. If you have a tendency to eat more than a serving (two small squares), consider buying only small amounts at a time or dividing what you buy into serving sizes as soon as you get home. But this doesn’t mean it’s advisable to pick up a drinking habit. Alco- hol won’t erase the risk brought on by other factors. Drinking any amount over what’s recommended will actually increase the risk of heart disease by causing high triglycerides (a form of cholesterol), high blood pressure, and weight gain. Alcohol can also be directly toxic to the heart and is asso- ciated with arrhythmias like atrial brillation. Drinking too much—even just a little too much—also increases the risk of cancer (particularly breast cancer), liver disease, and, obviously, alcohol addiction. For all of these reasons, the American Heart Association recommends that people do not start drinking alcohol as a means to lower their heart disease risk. Hydrate well before you have any alcohol. If you’re thirsty, you may unintentionally drink too much too quickly. Measure out your drink (5 ounces of wine, 12 ounces of beer) and then put the bottle or six-pack away. If you’re having mixed drinks, specify how much hard liquor you want and watch the bartender measure. Some bartenders are a lit- tle heavy-handed with the bottle. If you’re entertaining, mix up a pitcher of a tempting mocktail and have plenty of healthy and delicious appetizers on hand. It’s good for you and everyone else as well. Try the Bubbly Minty Mojito Mocktail recipe in Appendix A. Research shows that (nuts)... A.J. Mayhew et al. : “A Systematic Review and Meta-analysis of Nut Consumption and Incident Risk of CVD and All-Cause Mortality,” e British Journal of Nutrition 115(2), 28 January 2016, pp. 212–225. Another study found... Y.Q. Weng et al., “Association Between Nut Consumption and Coronary Heart Disease: A Meta-analysis,” Coronary Artery Disease 27(3), May 2016, pp. 227–232. Heart 101(16), August 2015, pp. 1,279–1,287. P.E. Ronksley et al., “Association of Alcohol Consumption with Selected Cardiovascular Disease Outcomes: A Systematic Review and Meta-analysis,” e BMJ 342, 22 February 2011, p. d671. ... UpToDate, updated March 2018, https://www.uptodate.com/ contents/cardiovascular-benefits- and-risks-of-moderate-alcohol- consumption.